Rusted Gingham: Win this Santa at the 2010 Barn Sale! 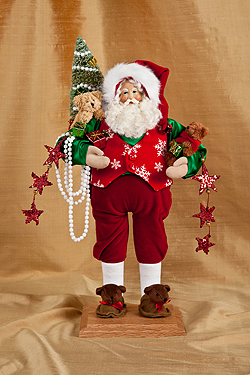 Win this Santa at the 2010 Barn Sale! At this time of year- We can’t help but start getting excited about Christmas! The weather is changing and we know the most glorious holiday of the year is coming! We love to celebrate the true meaning of Christmas in our home- Jesus - for he is the Reason for the Season!We also know that there are some other little ones around that get excited at the thought of Jolly Old St. Nicholas coming for a visit. He Sees You When You’re Sleeping, you know! For the past 10 years I've had the pleasure to work with Barbara at Laurel Ridge in Gonzales, Texas (http://laurelridgechristmas.com/). This is my favorite time of year to work in the store….You see- the place is always glorious- just a look at the Historic Home that encapsulates the store and amazing antiques inside and you can see that. But – once you step inside…it takes you to a different place and you forget all else. And this time of year is even beyond that – You step into a Christmas wonderland! Each room is decorated to the fullest with their own themes and spectacular ornaments, nativities, blown glass, garlands, crystal and Santas. And that is where ‘He Sees You When You’re Sleeping’ comes in. This little guy is just H-A-P-P-Y to have the job that he does. You see- he was hand made in Lubbock Texas by the staff at Lynn Haney. Yes- you read that right- Handmade in Texas! The fabrics and trims that Lynn selects for each of his annual creations are wonderful! I've admired all of his creations over the past 10 years and they just make me smile when I see them- this Santa is no exception. And- He needs a new home. Yes- you read that right as well….He wants to grace some special person's home to make them smile during the Christmas Season! Barbara was a happy shopper here at last years sale- and since she is so busy with her store right now- there is no way she could set up a booth out here- so she is doing a drawing for He Sees You When You’re Sleeping at her store in downtown Historic Gonzales- just a bit over 12 miles from here! All you have to do is go to the fabulous Laurel Ridge when you are done shopping here! Register in the store and the drawing will be held by the end of business on Saturday Nov 13th- you do not have to be present to win- just present to enter your name in the drawing! We can’t wait to see who is fortunate enough to have a Lynn Haney Santa in their home for this season- and all the seasons to come! So happy shopping here at the Barn Sale- and in Historic Gonzales, home of Laurel Ridge Antiques and The Christmas Corner.